18 May 2016 --- Popular infant formulas sold throughout the United States have been found to contain infinitesimally small ingredients known as engineered nanoparticles. A growing body of scientific research demonstrates that nanoparticles pose threats to human health, raising concerns about their use in food and many other consumer products. Friends of the Earth commissioned independent laboratory analysis that found nanoparticles in six infant formulas tested. These ingredients are not labeled and are not regulated by the U.S. Food and Drug Administration. Friends of the Earth's report, "Nanoparticles in Baby Formula: Tiny new ingredients are a big concern," details new findings from independent lab research and compiles data from health impact studies on nanoparticles. Nano-sized structures of potential concern found include nano hydroxyapatite, nano titanium dioxide and nano silicon dioxide. "This technology is moving from the lab to the marketplace without sufficient regulation, safety assessment and labeling," said lead author, Ian Illuminato, with Friends of the Earth. "It's of real concern that these tiny particles are used in hundreds of consumer products, and now in infant formula, with minimal to no oversight. Companies and regulators must take extra care with a product fed to the most vulnerable among us." "Few health impacts studies have been done on nanoparticles, so we have concerns about potential health impacts," commented Tracey Woodruff, PhD, MPH, with the University of California, San Francisco. "Some nanoparticles are 'needle-like' in structure. This is concerning. We don't know if they can possibly penetrate cell walls and migrate to other parts of the body, or cause harm when inhaled. The problem is, there hasn't been enough research to suggest that using the types of nanoparticles found in this infant formula study is absolutely safe." Mark Mitchell, MD, MPH, with the National Medical Association's Commission on Environmental Health agreed. "Our federal and state chemical regulatory systems are broken and have failed to protect our patients from illness resulting from product ingredients introduced into the marketplace before adequate health studies have been conducted. Babies' bodies are developing and can be especially vulnerable to exposures from hazardous materials. As a physician working with low income communities and communities of color, I am concerned that this new information on powdered baby formula may indicate disproportionate impacts on vulnerable populations." Lisa Archer, director of the Food & Technology Program at Friends of the Earth and herself a mother, wants federal agencies to protect the public: "Like many parents and caregivers, I had to feed my child formula. I'm outraged that poorly studied, virtually unregulated and unlabeled nanomaterials are present in infant formula. There are suitable non-nano ingredients that don't carry the same risks. The FDA must put a moratorium on the use of nanomaterials in formula and other food until they can be proven safe, and are regulated and labeled. 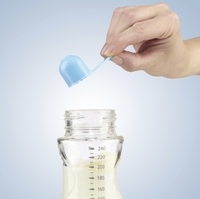 In the meantime, formula companies must immediately commit to not use these materials." This new analysis of nanoparticles in baby is meant to inspire greater public scrutiny, industry accountability and government regulation of nanotechnology, particularly in the food sector.